Oh my. This is easily my favorite read of the year so far. I honestly wasn’t expecting to love it as much. But I did. I ADORED this book. It pushed all the right buttons and managed to inspire me immensely. It made me feel pretty much every emotion on the spectrum and moved me so much. But as much as I just want to shout “FEELS! FEELS, SO MANY FEELS!”, let me try and explain this in a more or less coherent way. First of all, the writing style. It is gorgeous and poetic and artistic and full of beautifully crafted metaphors. So while it does take some getting used to at first and may not be equally appreciated by everybody, I did fall in love with it pretty much on page two already. It was also so inspiring and made me want to get up right away and do something creative. I almost feel like I can’t talk about the writing style without talking about the characters. Because the story is told in alternating point of views: either from 13-year old Noah or from 16-year old Jude. And it feels like you are inside their head and reading their most inner thoughts. I loved how they were both so quirky, unique and artistic in their thoughts, but still so completely different from each other and easily recognizable. I loved both their POV’s, but I must say I really fell in love with Noah’s POV the most. I wish I could see the world the way he does. The brother-sister dynamic is what drives the whole book and I loved how real it felt. They used to be best friends, inseparable until something happened that drove them apart. We spend most of the book trying to figure out what went wrong and where, through the alternating POV’s and timelines. Their relationship was so deeply flawed and even though they both did quite a few hateful things to the other, they were also both still fiercely protective of eachother. They just felt like such a real, flawed brother-sister duo and I loved getting to know both of them. The entire book is actually very family-centric. Though there is but a small cast of secondary characters, most of the interactions felt very focused on family. Complete with all the ups and downs. Both Noah and Jude, their mother and father, and even their deceased grandmother, play such a big role in the story. Not to mention, they all felt so real they could have jumped right off the page. And even the non-family secondary characters all felt just as flawed and real and lovable. Which brings me to the romance, which feels just as flawed and real as the characters, but is still so adorable as well. Noah is struggling with the fact that he’s gay and in love with his best friend, Brian. And Jude is on a boy boycott but somehow can’t stay away from the troubled model Oscar. Both romances are filled with sweet, funny, heartwarming and heartbreaking moments. But what I loved especially is that both romances are tied to the story and to the character development of Noah and Jude in such beautiful ways. It always felt intrinsic to the story and never just added on to have some romance. Overall, I just felt like this book was a piece of art itself. It’s a masterpiece: a story of family, tragedy, growing apart and coming together, love and loss, endings and new beginnings. And art. A whole lot of gorgeous, breath-taking, life-changing art. Have you read I’ll Give You The Sun? What did you think about it? 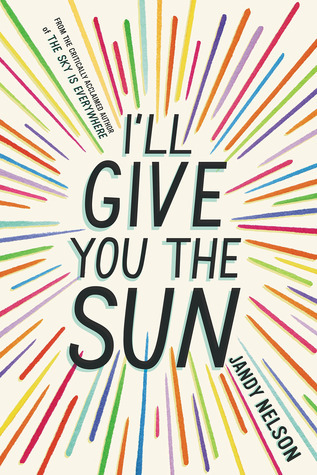 I read I’ll Give You The Sun last year and I absolutely loved it! It was such an amazing book and I can’t wait to re-read it! Yes! To all of this. I loved this one so much and agree t was like a piece of art in itself. Lovely review! This is on my TBR. Your review makes me want to read it sooner rather than later. Oh wow! Another glowing review for this book. I so need to get to it. I have it on my list at the library and I think I may have to read it sometime this year. It sounds SO good!! Really lovely review. I started reading this book and got a few chapters in but I just couldn’t get into it. You’re review makes it sound so amazing though I really do want to give it another go. Thanks for such a great review! This has been on my TBR since forever! Everyone loves it but still somehow I haven’t read it? IT IS HIGH TIME. I have read the Sky is Everywhere which was very emotional and the romance was adorable so you can’t kill me for not reading a Jandy Nelson book? Also, a new book by her is coming out this year and I am so excited! Oh, definitely read this one, it is sooo good <3 Well, I haven't read The Sky Is Everywhere yet so we are totally even 😉 I must get to it soon!